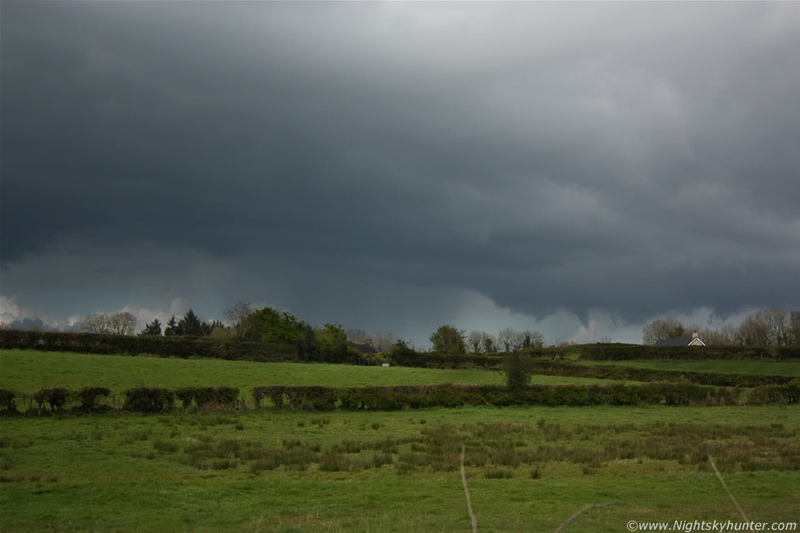 A very unusual sighting made by my girlfriend and I during an April walk in the Maghera countryside on Friday the 13th, an unstable airmass generated this line of small towers which began moving slowly towards us from the N then suddenly this long-duration dark funnel cloud dropped from the largest updraught, it was almost 10 miles away as the crow flies and the radar showed the cell to be near the town of Kilrea, however even at this range we could easily see this well defined funnel change shape by the second, it looked quite close to the ground too. This was taken with the 18-55mm kit lens and cropped. This was the first time I have ever seen a funnel with my girlfriend, the first time I have ever seen a funnel from a Nly flow and the first time I have ever seen a funnel form on the leading edge of a tower or cell where a gust front would normally be located, quite a lucky catch for Friday the 13th, read the report for more information. * All images are available for sale in the form of photo prints, canvas or digital files for licensing, if you are interested in a purchase simply drop me an email.